We often try to go for an evening walk (bike ride for Henrik) around our neighborhood after dinner and before starting the evening bedtime wind down routine. We have been opting for less reading on the couch recently and more walks to enjoy the pleasant weather and the extended daylight hours. We live on a plateau and we can stay on the flats when we head in two different directions from our house. We sometimes head in one of the downhill directions through the next neighborhood over to go to their local school for some big toy variety. We went in the other downhill direction once right after we moved into the neighborhood and were interested in exploring everything around us. Henrik was 2 ½ and was still riding in our Chariot stroller for longer walks (he would ride his tricycle or his balance bike on shorter walks). We were walking on the sidewalk down Rex Street between SE 42nd and SE 45th when we came upon a large Basset hound and its owner in their yard. The dog immediately barked and charged at us. We both backed up so that we were no longer in front of the dog’s house, but it did not cease its aggressive approach. I crossed to the other side of the street and I began loudly asking the dog’s owner to control her dog. Rob tried to walk away from me and the stroller to try to draw the dog away from us. The dog continued to come toward the stroller. Rob and I repeatedly asked the woman to control her dog. She had come into the street and rather passively tried to steer the dog back toward their house. She was rather large and was not actually able to bend over and reach the dog’s collar to restrain it. I was so fed up that I pulled my pepper spray out of the stroller and let the woman know that if the dog continued to approach that I would spray it. Then the woman began to threaten me. The whole situation was so unimaginable. We eventually made it to the sidewalk on the opposite side of the street and the dog, who was quite overweight, ran out of steam. The dog’s owner actually warned us to never come down her street again. I was so upset that one of the first interactions we had had with people in our new neighborhood had been so negative. (since no one was bit the first time) with the dog, that we had no recourse. This weekend will be the 2nd anniversary for us in our current house. Neither Rob nor I have initiated a walk in that direction since meeting the Basset hound. I went on a walk last week by myself down the hill and ended up walking by that house. The dog was not around, but there was a Basset hound banner proudly displayed out front. I saw a house on my walk that was shaped just like ours, but was much more attractive. Instead of the traditional 50s ranch cedar shake it had a very appealing stucco exterior. Our house was painted officially the least attractive color by the previous owner. I think she might have actually color matched baby poop. We have been tempted by the current sale at Ecohaus on YOLO exterior paint to put us out of our misery. The stucco house got my brain churning on new possibilities to beautify our house. But, one of my project ideas involves exterior paint and the other involves exterior paint and multiple thousands of dollars. The cedar shake to stucco siding retrofit is not in our foreseeable future, but I still wanted Rob to see the house. We all walked down the hill that evening. Once we passed our usual boundary line Henrik immediately asked if we were going to be chased by a dog. It has been two years since we encountered the dog and it is not a subject we have rehashed. This is why we call Henrik the “lockbox”. We worked our way down the hill to not the dog street, but the street with the cool house. Henrik was more interested in the supped up Chrysler 300 that was parked out front than in the house. We zigzagged our way street by street back home checking out this area of our neighborhood with which we were so unfamiliar. We came upon a couple walking down their stairs toward the street and greeted them. As we passed by their intricate landscape we came to a driveway upon which rested a black cat. Now, the main goals of our evening walks are to get in some extra exercise and to wear Henrik down as much as possible before bedtime. But, an equally important goal of ours is to pet as many kitties as possible. We don’t have a cat right now, but we all long for feline companionship. I squatted down and began to call out to the black cat. I hadn’t realized that the driveway belonged to the couple whom we had just greeted. The man called out to us and told us that the cat was named Captain Jack. He was a dominant figure and his name suited him. Henrik had ridden his bike down to the corner as Rob and I tried to coax Captain Jack toward us and when he realized that we had stopped, he turned around and headed back toward us. Henrik had barely dismounted his bike when Captain Jack strutted past both Rob and me and headed straight for Henrik. I used to be the one who was able to lure most any cat to me. I now look like an amateur compared to Henrik. People will often call out to us as we try to get a cat to come to us that the cat is completely unfriendly and then we are all surprised when the cat walks up to Henrik. Rob and I often walk away without getting to pet a cat that only Henrik had been permitted to pet. So, the subject of Captain Jack struck up a conversation between us and our newly acquainted neighbors. Over the course of the next 20 minutes we got a rundown of the history of the neighborhood and, of course the history of Captain Jack and his cat buddy, Happy. I did not get to pet Happy, but Henrik informed me that she was very soft. The subject changed from cats to a wagon. 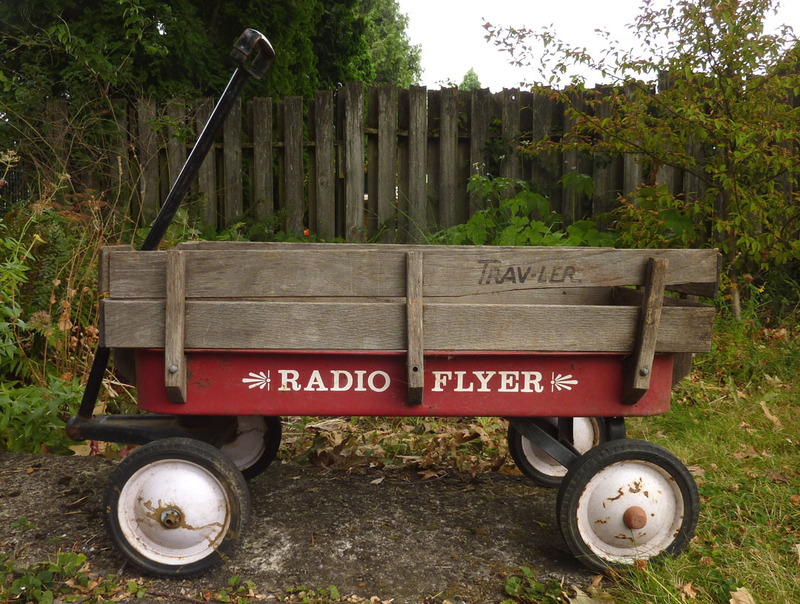 We were asked if we would be interested in becoming the new owners of their old Radio Flyer wagon. 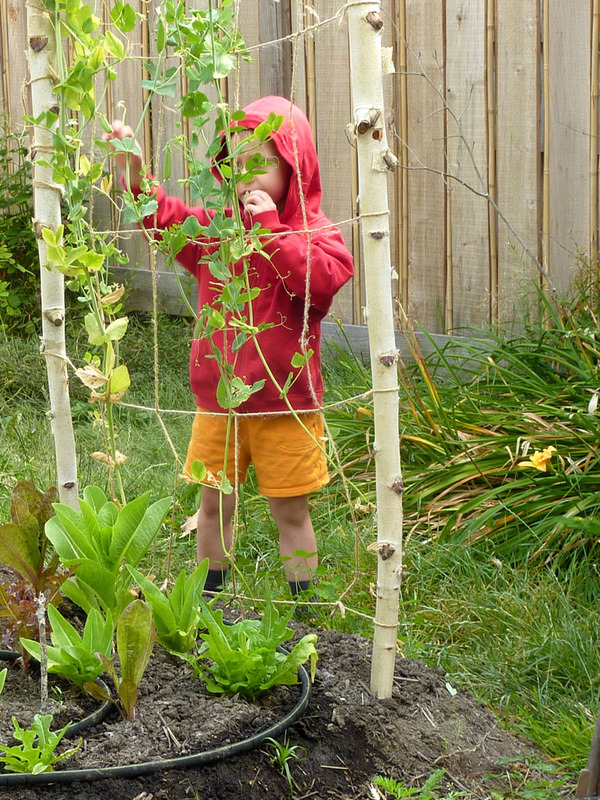 It had been used to pull their son, younger than Henrik at the time, when they first moved into the neighborhood, but had more recently been used as a planter. The wagon had seen better days, but we did not own a wagon so we graciously accepted the offer. Henrik was thrilled. My heart warmed after such an enjoyable interaction with our neighbors just one block away from the dog debacle two years ago. He wanted to tow the wagon back up the hill without any help from us. 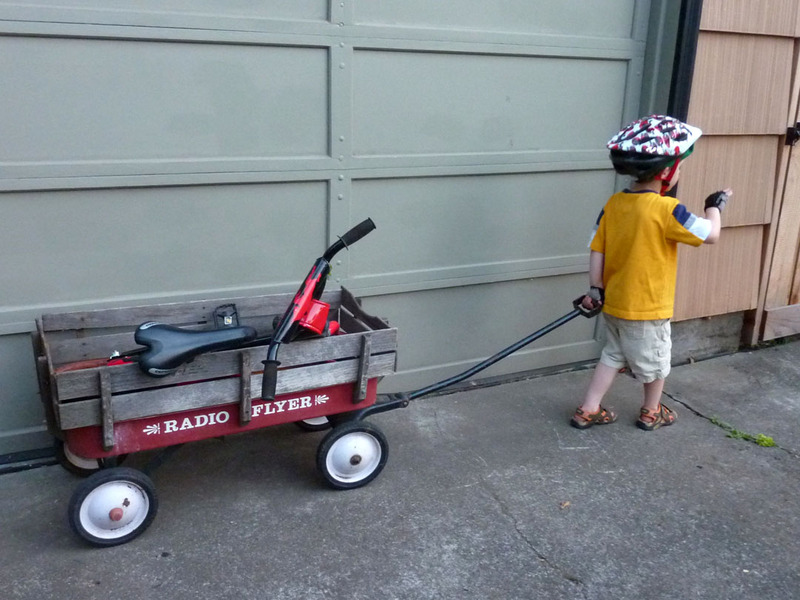 He even towed his own bike in the wagon most of the way home. He chose to pose like a statue for this picture. We talked on the way home about how to go about restoring the wagon. Henrik decided that he wanted it painted orange with red racing stripes. He has now decided that red with orange racing stripes would be better. It seems to be a theme in his wardrobe these days also. 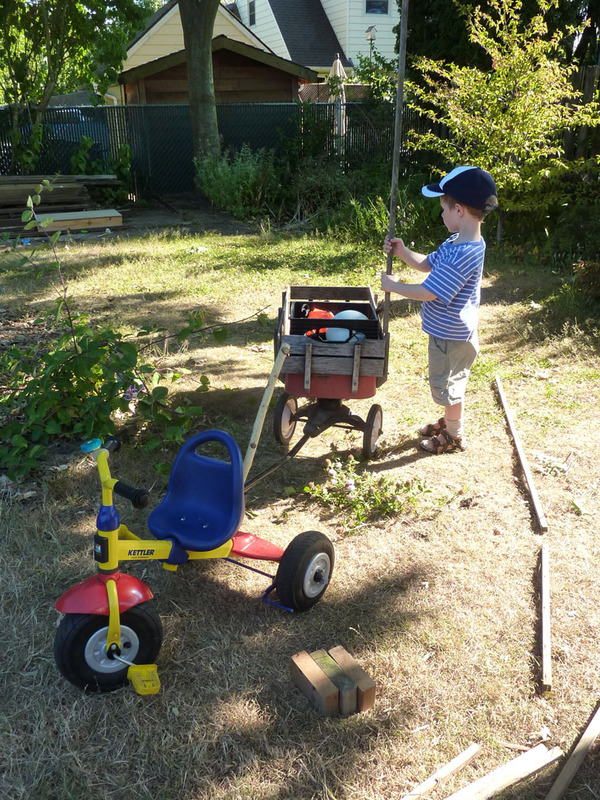 Henrik has had lots of fun hooking the wagon to his “worker truck” (tricycle) and towing around everything under the sun in the backyard. Thank you, Dody and Andy. You gave my husband a new project with which to tinker. You refreshed my belief in the kindness of strangers. And, Henrik now has a wonderful new toy. We are delighted to know that you live in our neighborhood. Here is Henrik’s thank you card for Dody and Andy. 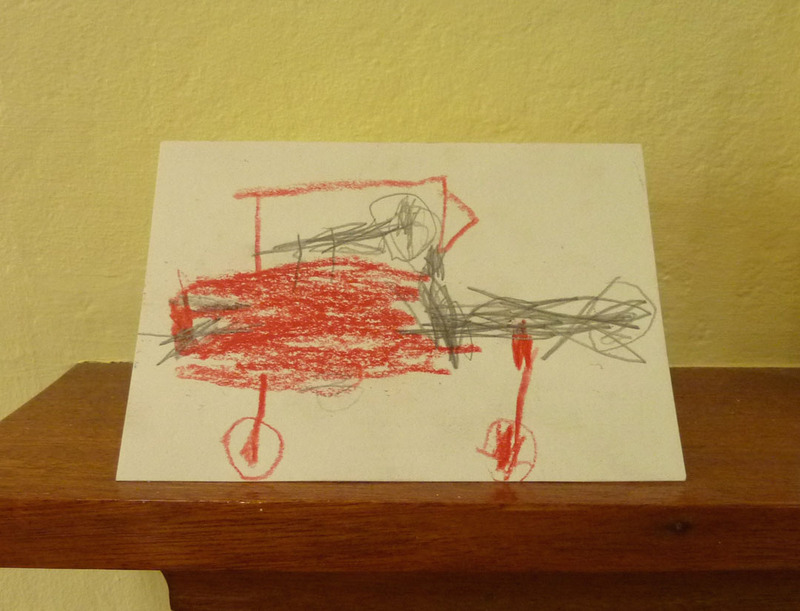 It is a drawing of Happy riding in the wagon. This entry was posted in Enjoy, Family, Gratitude, Learn. Bookmark the permalink. Oh my goodness! Dody and Andy are my parents! That wagon used to be mine! We are hoping to enjoy just as many fond memories with the wagon as you! This entry was posted in Enjoy, Family, Gratitude, Learn, Uncategorized. Bookmark the permalink.